A poem about snowHas struck a new low -This single star it gets.A waste of time to readDull and tedious screed -As sun on life now sets. 2015: I read this almost every year, on the wintriest day. Miss you, Dad.2009: My dad's favorite poem--and a perfect day to reread it! It's really somewhere between a 3 and a 4. My favorites are Snowbound and Maud Muller as well as the ending of In School-Days. My edition is about pocket, lovely cover and equally lovely illustrations. It was a random happy find. A mood-setting of an evening when snow-bound in a New England village. The copy I have was printed for the Limited Editions Club in 1930 at the Yale University Press, copy 586 of 1500 numbered and signed copies signed by designed Carl P. Rollins, printer to the University. (I think the initial blue florid capital letters not suited to the poem nor to the book design.) The book is designed as a folio in size with black spine and bound in (faded) "quarter navy blue moire cloth stamped in silver with delicate marbled paper boards in shades of gray and blue." My copy lacks the original slipcase. My father gave this copy to me ca. 1950 and which I've read perhaps each ten or twenty years since then. I shall give this to Jeff at some future time when it seems timely.The story evokes a winter in New England, an evening with the presence of family and a few relatives. Such fine imagery! "Unwarmed by any sunset light, the gray day darkened into night, a night made hoary with the swarm, and whirl-dance of the blinding storm." And later:- "What matters how the night behaved? What matter how the north-wind raved? Blow high, blow low, not all its snow could quench our hearth-fire's ruddy glow. "Family remembrances recur. "Ah, brother! only I and thou are left of all that circle now,- the dear home faces whereupon that fitful firelight paled and shone...." [Whittier the narrator then indulges in a reflection on the past-ness of the scene:] “with so much gone; . . . The voices of that hearth are still.” [His family is largely dead and gone, but] “Life is ever lord of Death,/ And Love can never lose its own! We sped the time with stories old, wrought puzzles out, and riddles told..." And then these sections:-Our father rode again his ride, on [Lake] Memphremagog's wooded side.Our mother, while she turned her wheel, or run the new-knit stocking-heel.Our uncle, innocent of books, was rich in lore of fields and brooks.Next, the dear aunt, whose smile of cheer and voice in dreams I see and hear.There, too, our elder sister plied her evening task the stand beside.Brisk wielder of the birch and rule, the master of the district school....Another guest[an annoyingly religious woman] that winter nightflashed back from lustrous eyes the light.At last the great logs, crumbling low, sent out a dull and duller glow....Next morn we wakened with the shout of merry voices high and clear;and saw the teamsters drawing near to break the drifted highways out.So days went on: a week had passed since the great world was heard from last.Clasp, Angel of the backward look and folded wings of ashen gray and voice of echoes far away; the brazen covers of thy book; the weird palimpsest old and vest, wherein thou hid'st thespectral past; where, closely mingling, pale and glow the characters of joy and woe...And Whittier ends in an elegiac postlude calling for a pause to reflect in the midst of the bustle of a changing world. As Whittier recounts his memories of a New England snowstorm during his nineteenth century childhood, he hopes the reader will “Sit with me by the homestead hearth,/And stretch the hands of memory forth”. He describes the storm and aftermath, when the family and farm are completely cut off, isolated in a way that may be hard to imagine today:“Unwarmed by any sunset light/The gray day darkened into night”.“And, when the second morning shone,/We looked upon a world unknown…/No cloud above, no earth below--/A universe of sky and snow.” The heart of the story is the scene of his family and their guests gathering on the cold evening by their big fire: “And ever, when a louder blast/Shook beam and rafter as it passed,/The merrier up its roaring draught/The great throat of the chimney laughed.” They roast nuts and apples, tell jokes and stories, and listen to the adults talk about their experiences: “We shared the fishing off Boar’s Head,/And round the rocky Isles of Shoals/The hake-broil on the drift-wood coals;/The chowder on the sand-beach made,/Dipped by the hungry, steaming hot,/With spoons of clam-shell from the pot”. The next day, they wake to the sound of ox teams coming to clear the roads and to ask for their help in this community work, and the doctor stops by next to ask his mother to sit with one of his patients that night. And finally, "the floundering carrier bore/The village paper to our door. "...Wide swung again our ice-locked door,/And all the world was ours once more. "Over the course of the poem, the poet’s thoughts almost take the path of his memories, travelling between the past and the present: “Ah brother! Only I and thou/Are left of all that circle now,--/The dear home faces whereupon/That fitful firelight paled and shone.” Duty calls him back to the present and “importunate hours that hours succeed/Each clamorous with its own sharp need”. Still he hopes readers will “pause to view/These Flemish pictures of old days” and that their enjoyment will somehow flavor his own life in this beautiful image:“…From unseen meadows newly mown, Or lilies floating in some pond,/Wood-fringed, the wayside gaze beyond./The traveler owns the grateful sense/of sweetness near, he knows not whence,/and, pausing, takes with forehead bare/The benediction of the air”. just read this one poem...What matter how the night behaved?What matter how the north-wind raved?Blow high, blow low, not all its snowCould quench our hearth-fire's ruddy glow.O Time and Change! - with hair as grayAs was my sire's that winter day,How strange it seems with so much gone,Of life and love, to still live on!Ah, brother! only I and thouAre left of all that circle now, - The dear home faces whereuponThat fitful firelight paled and shone.Henceforward, listen as we will,The voices of that hearth are still;Look where we may, the wide earth o'er,Those lighted faces smile no more.We tread the paths their feet have worn,We sit beneath their orchard trees,We hear, like them, the hum of beesAnd rustle of the bladed corn;We turn the pages that they read,Their written words we linger o'er.But in the sun they cast no shade,No voice is heard, no sign is made,No step is on the conscious floor!Yet love will dream, and Faith will trust(Since He who knows our need is just),That somehow, somewhere, meet we must.Alas for him who never seesThe stars shine through his cypress-trees!Who, hopeless, lays his dead away,Nor looks to see the breaking dayAcross the mournful marbles play!Who hath not learned, in hours of faith,The truth to flesh and sense unknown,That Life is ever lord of Death,And Love can never lose its own! This poem written in 1866 from the point of view of an elderly man, is a fond remembrance of the author's family and two visitors caught together in a winter storm and snow bound at home. Whittier evokes the power of the storm and the delight and warmth of the safety of home and family. The poem concludes with the intrusion of the outside world as a path is carved in the road by teamsters, a doctor calls for his mother's aid and a newspaper is delivered with its reports of what would have been the aftermath of the Civil War. It is an ode to a moment in boyhood clearly held dear by Whittier who looks back over long years and the deaths of nearly all the people in the poem. His description of the storm is highly successful, and although others who have reviewed this work have lambasted it as 'awful' and 'boring', it is a product of both the man and his time. His elegiac style is perhaps not for everyone.My edition was printed in 1892 the year Whittier died, and is No. 71 of a small run of 250 copies. The book itself is beautiful, bound in white and embossed with gold. Printed on 'Japanese paper' thick and creamy in texture and appearance, the poem is illustrated with nine photogravures by E. H. Garrett. A Quaker poet who came into his writing discipline later in life. The story poem of Snowbound is so elegantly written, engorged with life applications and endearing memories, that I found myself wishing for simpler times, a larger than life imagination,.. and the relationships so delicately outlined by verse and rhyme. Early 19th-century New England. A poet's memory of his boyhood household being snowed-in. A series of character-sketches. Aptly captures the event both in its particularity as well as its universality. The rhyme and meter feel old-fashioned and naieve, but there's a genuine sweetness and realism there. I seldom sit down to read a cap book of poetry but this was appropriate for the snowstorm. It will take you back to another time and place. A mature, reflective piece that I was ready and in the right frame of mind for. Worked well for me. 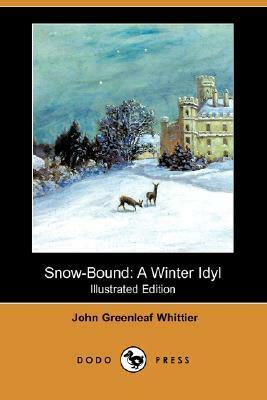 A poetic tale remembering how it was to be snowbound in New England in the early 1800's. Mentioned in Isabella Bird's story of the snows she experienced in the Rocky Mountains in the late 1800's. John Greenleaf Whittier Harry Fenn A.V.S. Anthony - John Greenleaf Whittier was an influential American Quaker poet and ardent advocate of the abolition of slavery in the United States. He is usually listed as one of the Fireside Poets. Whittier was strongly influenced by the Scottish poet, Robert Burns.